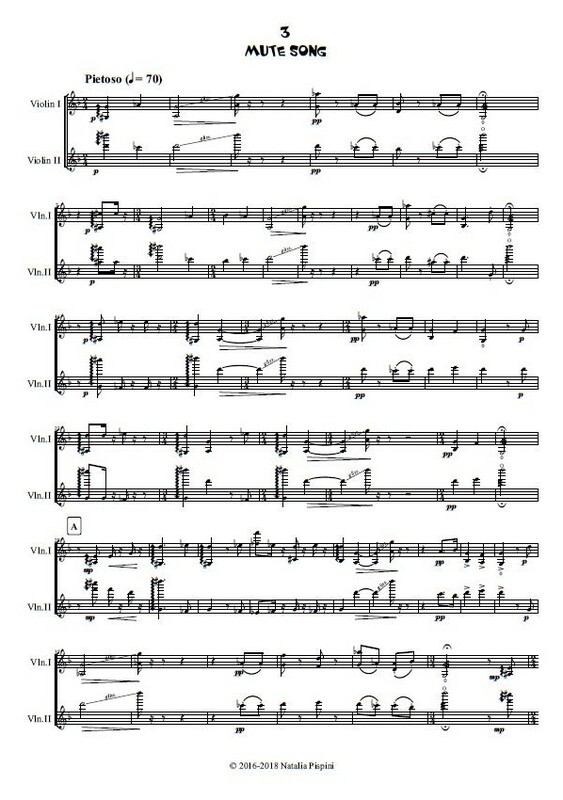 The idea behind of this music was growing slowly, from my early piece ‘Mysterious Steps’ for solo violin (2016) to the later drafts for duo violins, from, initially, 3 separated pieces cycle to 4-pieces suite with a palindromic ending. The concept of two egos debating, fighting or coexisting in peace, and all this is inside of a weird woman’s mind, who is bearing bird-like characteristics and behavior: she is as quick in movement, light in thinking, changeable in mood, fragile in sadness as a bird could be. While that ‘birdish’ character defines the music stylistics, the idea of the double egos is converted to the constructive principle of palindrome or mirror. Each piece of the suite solves this ‘puzzle’ in its own way. There are two contrasting sections with dancing themes in 2/4 and 3/4. 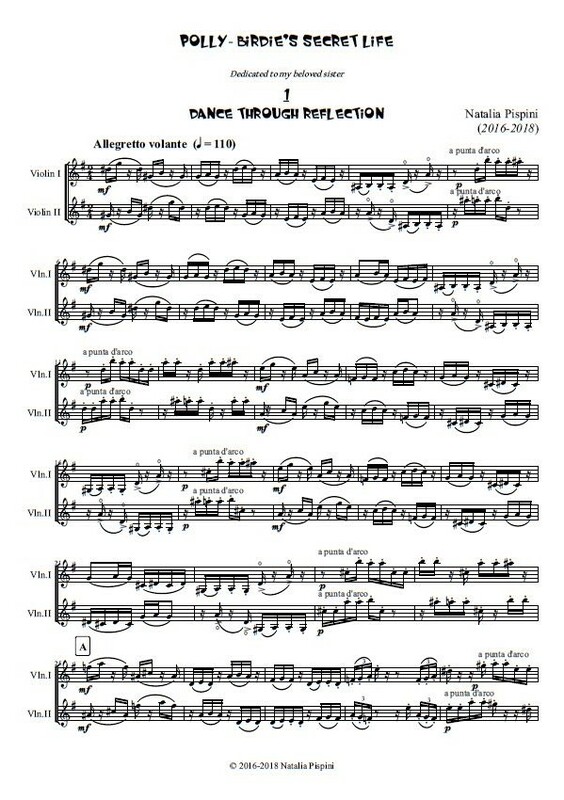 The 2nd violin plays palindromic variants of each measure of the 1st violin’s part in section 1, and the palindrome of the whole theme played by the 1st violin – in section 2. This is 2-voice canon with a long temporal distance between voices and basically tritone interval relationship. The leader voice isn’t imitated exactly but with some changes in melody as well as interruptions. At the same time this is variation form where there are ‘assigned’ changes within the tones (some tones go to more extension and rhythmic transformation, and others are less modified). While the variation theme is progressing in an aggressive manner, the second, mild and compromising theme is flashing and finally takes over. 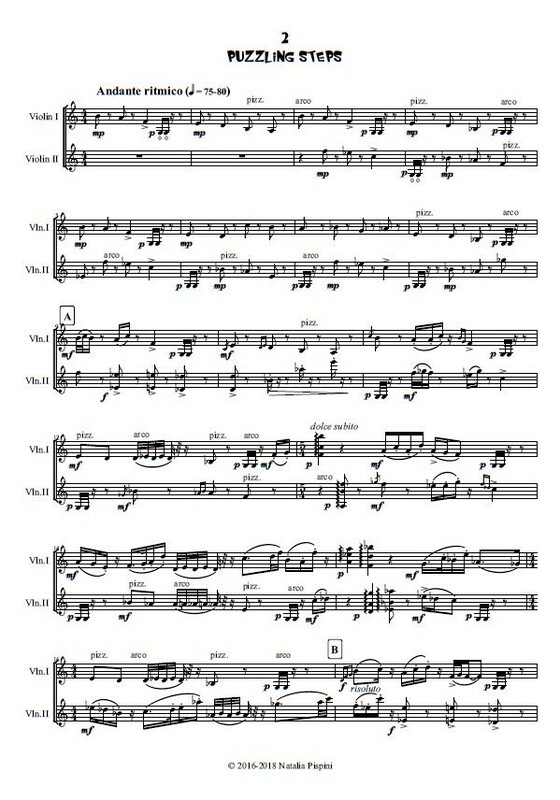 The free-scale lines like in some folk song traditions resemble an improvised singing manner and serve to recreate sad mood and haunting thinking. 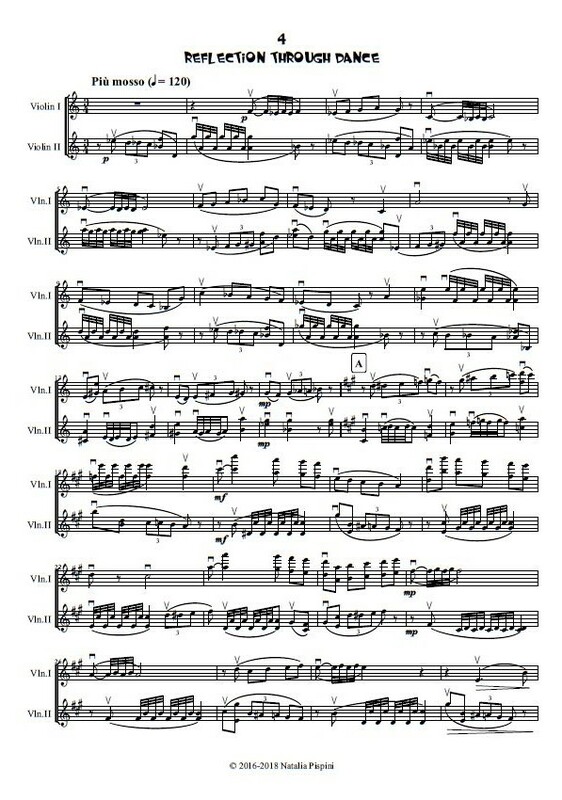 The 2nd violin’s part is a mirror reflection of the 1st violin’s music, sometimes transported in octave higher, or enriched with additional tones. The note alteration signs are often preserved in non-convenient and ‘mistakable’ way to keep the desirable intervallic combinations between two violins. It’s return to the music of the 1st piece ‘Dance Through Reflection’. The same two sections appear in opposite order: 3/4, then 2/4. Section 1 is a mirror reflection of the section 2 of the 1st piece. Section 2 is a measure-by-measure palindrome of Section 1 of the 1st piece. It is possible to play pieces No. 1, 2 and 4 in slower tempo than indicated. I think that the idea of this suite might be supported by special appearance of the musicians on stage, when the first violinist dressed in white, and the second in black. Some elements of theater or pantomime are suitable if it matches to the character of the players. (I see it in mysterious and slightly dramatic modus, not in comic one). My suggestions are: (1st piece) playing face to face, turned to the listeners by sides, and gradual changing of mutual positions; (2nd piece) playing and performing steps, i.e. slow walking on stage towards the opposite corners (or whatever can be identified like ‘corners’); (3rd piece) the players are sitting in opposite corners and turned back to the listeners; (4th) gradual returning to the initial position. It is up to the musicians to decide about the exact style of movements and gestures, and further elaboration of extra-musical aspects of their performance.
! This work may be commissioned or/and performed. For your inquiry please contact Natalia. In your message, kindly provide some information (brief introduction, collective’s title, website, contact details). The score, parts and all necessary material will be sent to you within a week.